Today is February 25, 2008, and it is the 22th anniversary of the People Power Revolution of 1986, which saw the overthrow of a dictator by a civilian population and the restoration of democracy in the Philippines. This is one of the proudest moments in Philippine history and Bob Simon, an anchorman at America’s CBS said it best: “We Americans like to think we taught the Filipinos democracy; well, tonight they are teaching the world.” It’s just extremely sad that after 1986, the Philippines is still limping from one political challenge to the next. But hope springs eternal and I still believe in the Philippines. 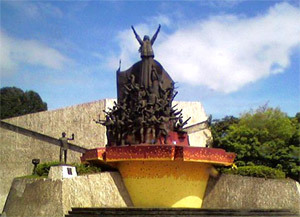 The People Power Monument, located at the corner of Epifanio delos Santos Avenue (EDSA) and White Plains Avenue in Quezon City, is a sculpture commemorating the revolution. Interestingly, this sculpture, named “People Power”, was created in 1993 by Ed Castrillo, that same guy that did the sculpture at the heart of Pinaglabanan Shrine, which I featured a few days ago. There’s also the EDSA Shrine, which is an earlier commemorative landmark to the revolution. I couldn’t find any significant description about the sculpture on the Internet but quite visible is the oversized woman holding aloft her arms wearing shackles with broken chains. We can surmise that she represents freedom. Behind her is the Philippine flag and arrayed around her are people representing various sectors of society that participated in the revolution. I have no idea who the lone statue is to the north of the sculpture (on the left side of the photo above). After characteristically flip-flopping on whether this day is to be a holiday or not, President Arroyo finally declared it as a special non-working holiday amidst mounting pressure for her to resign due to her alleged involvement in the ZTE-National Broadband Network scandal. No doubt she worried that a holiday today would push the “civil society” to mount a large rally against her. Thus, the current political atmosphere is certainly not the best time to commemorate the revolution and activities today are therefore quite restrained. I created a 360 spherical panorama of this monument. You can view it here.